Lynne is a writer and journalist, with over 30 years of experience covering feature stories and human interests. Her mid-life lifestyle blog is a place where she muses about a bit of everything – from opinions to family to humor to travel. A metro-Detroiter, Lynne’s print media journey as a “real writer” started when she became a regular contributor for her community’s weekly newspaper. The editor of the Mirror Newspapers took a chance on a column written for Christmas. His generosity led her to other fantastic writing opportunities. Before budget cuts ended a wonderful weekly magazine, Lynne’s readers could find her articles in the pages of the Detroit Free Press – Twist. Lynne has had op-eds published in major dailies, a series of columns published in Military Spouse Magazine and a few stints as an associate editor for a local newspaper as well MetroParent magazine. She spent some time as a reporter and writer for the hyper- local Royal Oak Patch. Most recently, Lynne has had articles published in Guideposts’ Angels on Earth, the Easter Ideals 2015 and Michigan Prime Magazine. She is also a contributing author in the anthology, Feisty after 45. 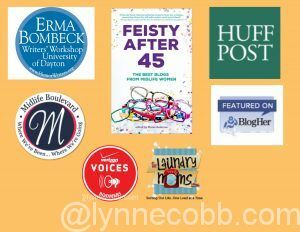 Several of her blog posts have been featured on Erma Bombeck’s Writing Workshop page, Midlife Boulevard, BlogHer, Vibrant Nation and HuffPost50. She is also a member of Detroit Working Writers and the National Society of Newspaper Columnists. Lynne is available for workshops and speaking engagements. Contact her via email, lynne@lynnecobb.com, through her contact page, as well as on social media: Twitter @LynneCobb; Facebook, and LinkedIn. For Terms of Service/Privacy, click here.